If you are short on square footage in your home, having a home office can seem like an impossible dream, but fear not, there are plenty of ways you can squeeze in a small home office, starting with the perfect space-saving desk. From West Elm to John Lewis, we've rounded up our favourites to get you inspired. This Marcell Compact Desk from Made is a beautiful modern design that would make a nice addition to your study if you’re a fan of minimalist and Scandi interiors. In fact, this desk is quite narrow and could also be tucked nicely in the corner of your bedroom, lounge or even in the hallway. It’s a simple rectangular design that provides a practical workspace that won’t compromise your living space, and it has ample storage for documents and a pull out tray for your computer keyboard. If you just need a place to set up your PC or laptop, then this compact desk with storage is said to be just the right amount of space to set up a workstation. Customers love how easy this desk was to put together, and it has just the right amount of storage with two drawers beneath it. The slanting edge adds a modern feel to this desk and there is plenty of room left over to add a lamp or other accessories should you want to. If you’re looking for super compact, then this is one of the best desks for small spaces as it has nearly no footprint. This ladder desk is designed to lean up against your wall, to create a quick and simple workstation in your home. This is an incredibly modern, forward thinking design that might not be for everyone, but we certainly think it looks cool. The design features two upper shelves which mean this desk essentially doubles as a shelving unit, and the single desk has a tray area for storing any documents or your laptop out of sight. For a plain and simple design that keeps the room looking light and airy, this Scandi-style corner desk is a great option. with curved edges and a white wood finish, it could easily complement a wide range of decors. Whether it's a home studio or children's bedroom, this desk offers just enough room to sit and write at, with a handy shelf for paperwork and other stationary. This small and compact desk may remind you a little bit of your school days, but we think it would be a great addition to the home if you need a small space to work on occasion, or in the kids bedroom for them to do their homework. 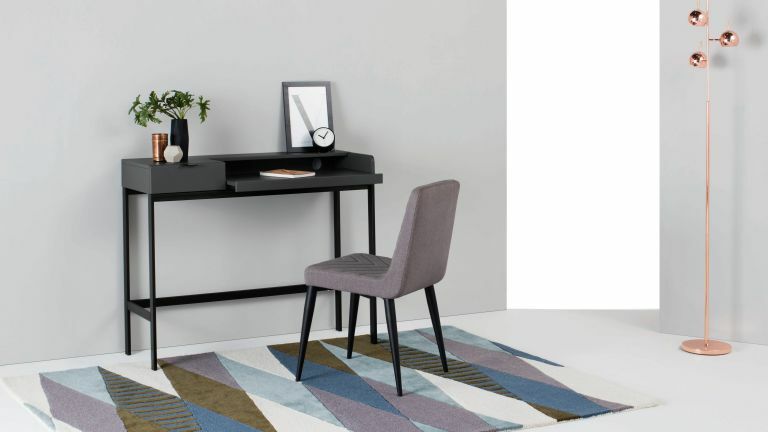 It has a stylish two-tone finish, which gives this office desk a modern twist, and customers love how well it complements a wide range of decors. It’s easy to assemble and John Lewis also has other items in the range to match, so you can kit out your study or bedroom and save on space. If you’re somebody who really hates clutter, then this wall mounted desk will certainly save you a lot of space. it is entirely bespoke, and comes made to order when you purchase other items in the Woood collection. It has a shabby chic yet smooth finish which would look smart with any colour scheme, and the sliding door with shelf makes it easy to store messy paperwork out of sight. Looking for more home office inspiration?